Louise Rosskam. 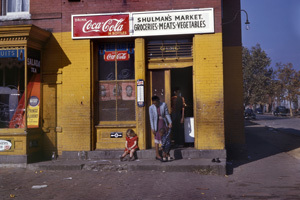 [Shulman’s Market, 485 1/2 N at Union Street, SW, Washington, D.C.], 1942. Kodachrome transparency. 4 x 5 inches. Courtesy of the Library of Congress. Classic paintings, dreamy films, flamenco dresses, and raw photographs all punctuate Inner Piece: Works from the Heather and Tony Podesta Collection, one of the six new exhibitions opening the American University Museum at the Katzen Arts Center’s 2011–2012 season on Saturday, September 3. The exhibition is a selection of works from the private collection of noted contemporary art collectors Tony and Heather Podesta. The couple is well known for their respective lobbying firms (and Tony Podesta’s brother, John Podesta, was President Bill Clinton’s Chief of Staff), but are equally well known for being among the country’s most prominent contemporary art collectors. Spanish artist Pilar Albarracín’s works focus on social injustice, violence against and the repression of women. Celebrated Irish artist and filmmaker Clare Langan is internationally known for her beautific images of natural landscapes. Photographs by renowned American video artist Laurel Nakadate depict the artist entangled in emotional situations. Works by British painter Julie Roberts focus on social issues—her earlier works (some of which are included in the exhibition) often depict medically-related images against solid color backgrounds. Five other new exhibitions open Saturday, September 3, alongside Inner Piece: Works from the Heather and Tony Podesta Collection—Re-viewing Documentary: The Photographic Life of Louise Rosskam, Bruce Conner: An Anonymous Memorial, Wayne Barrar: An Expanding Subterra, Gifts of Duncan Phillips, and Seismic Dream. All exhibitions close on Wednesday, December 14, except Bruce Conner: An Anonymous Memorial and Gifts of Duncan Phillips, which both close on Sunday, October 23. Re-viewing Documentary: The Photographic Life of Louise Rosskam examines the work of Louise Rosskam, an elusive pioneer of the golden age of American documentary photography in the 1930s and ‘40s. The exhibition features Rosskam’s poignant photographs of a Southwest Washington, D.C. neighborhood before its destruction for urban renewal projects. It highlights her compelling images of Puerto Rico, as it developed from an impoverished U.S. possession to an industrialized commonwealth—the political status of which remains a contested issue. The exhibition, to date is the most extensive retrospective of Rosskam’s work, spanning from the 1930s through the 1960s. It showcases more than 150 photographs—including black and white gelatin silver prints and large color photographs made with the recently discontinued Kodachrome film. The exhibition also presents the vintage photo-books produced by Rosskam and her better-known husband, Edwin; popular magazines, journals, newspapers, and books that reproduced her work during her lifetime; contemporaneous articles about the Rosskam photo-team; and Rosskam’s original Rolleiflex camera. Rosskam (1910–2003) graduated with a B.S. in biology in 1933 from the University of Pennsylvania. Her artist/writer husband and his friends encouraged her to abandon the microscope for the camera and become a socially committed documentary photographer. She worked for several government agencies in the late New Deal and World War II years and produced much of her best urban street photography in the nation’s capital. Her photographs appeared in newspapers and magazines such as Life, the Philadelphia Record, and The American Magazine. Laura Katzman, associate professor of art history at James Madison University, and Beverly W. Brannan, senior curator of photography at the Library of Congress, guest curated the exhibition. Grants from Michael D. Abrams (AU, JD Law ’85), Daniel and Jane Solomon of the Woodbury Fund, the Judith Rothschild Foundation, and James Madison University support the exhibition and catalogue. The American University Museum, in association with Penn State University Press, published the accompanying book. Bruce Conner: An Anonymous Memorial, an exhibition of works by a master of many media and as many identities made in response to the September 11, 2001, terrorist attacks, will be open during the 10th anniversary of the most deadly attacks on U.S. soil since Pearl Harbor. The exhibition also includes Eye on the Sparrow (2006), one of Conner’s last films. Wayne Barrar: An Expanding Subterra depicts hidden underground worksites of mines, power stations, universities, storage facilities, and offices, as well as the surreal domestic world of the subterranean homes in Coober Pedy, an opal mining town in South Australia where many residents shield themselves from the scorching temperatures of the Australian outback by living underground. Over the course of the exhibition’s development, New Zealand photographer Barrar travelled through America, New Zealand, Australia, and France, seeking the subterranean places in which people live, work, and play. Duncan Phillips founded Washington, D.C.’s The Phillips Collection, but he also played a major role in the development of American University’s Art Department and museum collection. Gifts of Duncan Phillips showcases the major artworks he gave directly and indirectly to AU’s Watkins Memorial Collection, as well as works by the Art Department’s early faculty members Phillips recruited and encouraged. The exhibition runs in conjunction with 90 Years of New, a celebration of The Phillips Collection’s opening in 1921. Read about Phillips' influence at American University. Seismic Dream (http://www.american.edu/cas/museum/gallery/seismic-dream-firestone-buchanan.cfm) combines original sculpture, music, and poetry in a dreamscape conveying a wavelike energy transcending space and time. It is the first exhibition in the Sylvia Berlin Katzen Sculpture Garden to feature a sound component. Waves of twisted steel that move in and out of the walls draw one into a dream and convey feelings of being both large and small in relation to nature. A poem on the sculpture garden wall enhances these promptings. As one walks through the dream, mystical pulsating music emanates from the steel outlines of a simple house and a vehicle, both at skewed angles. Finally, the viewer reaches the climatic earthquake on the far wall where the rhythms of the sculpture rupture abruptly, only to move back into wavelike patterns again.